We are hugely proud of our brand new studio here at Verulam GC, and here are just some of the services we will be offering and how you can expect them to improve your game. With a full range of the biggest brands in the industry featuring; PING, Callaway, Titleist, Mizuno, Wilson and Lynx. You won't need to go anywhere else to seek the perfect set of clubs. Using the latest technology with our GC2 Launch monitor we can study the characteristics of your ball flight and fit the clubs to match your swing. In Addition to our GC2 Launch Monitor we also have a very clever piece of equipment called HMT (Head Measurement Technology). This will give us very detailed information about what your club is doing at impact. Mixing this with the use of Slow Motion Video we are effectively making our coaching the most advanced in the area. Do you know how far you hit every club? Do you know how much spin you create? In our studio we will be able to educate you on how far each and every one of your clubs goes. Selecting the correct club is essential to low scores. 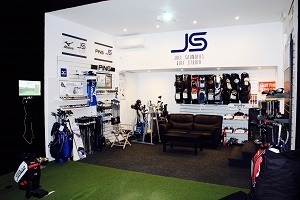 Click here to get in touch if you would like to book a lesson, fitting or practice session in our studio. Fancy playing the US Open course? Or fancy testing yourself on the Ryder cup course? We have a selection of 18 hole championship golf courses loaded onto our simulator (Abu Dhabi GC, Hazeltine GC, Emirates GC, Oakmont GC and many more...) stay dry and warm when the weather is bad and come and conquer the best courses in the world. - Simulation play - £25 per hour (£30 outside of shop opening hours). Courses available: - Hazeltine National, Oakmont Quail Hollow, Emirates Club, Royal Troon, The Belfry, Teyton Pines. For further details or to book your session, click here to get in touch.